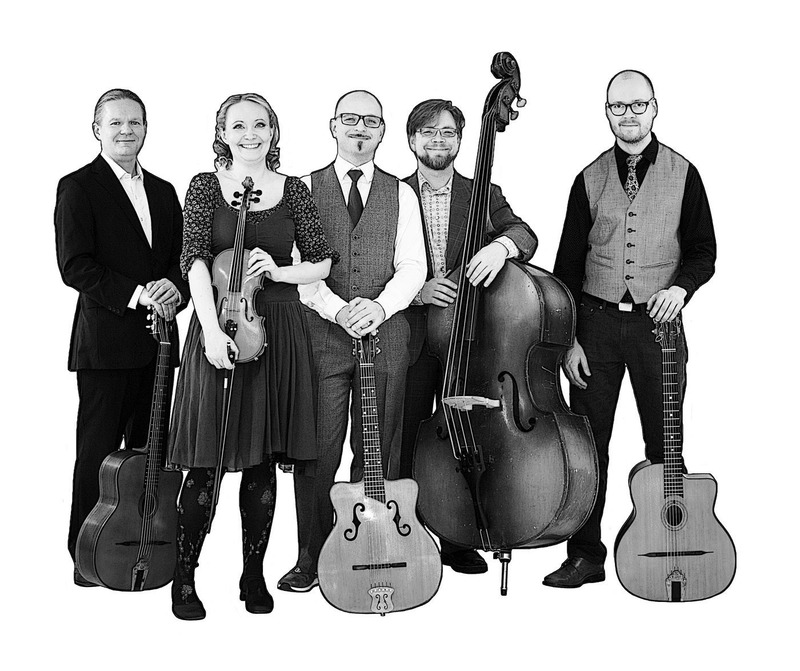 Django Collective Helsinki is a group of skilled professional musicians sharing the love for the passion and expression of Gypsy Jazz music. The Collective started out in 2011 and has been performing at jazz festivals, clubs and private occations frequently since then. They are specially popular for their welcoming and warm-hearted jam-concerts, which have become a phenomenon of sorts in Helsinki. It is the romantic, traditional and good-humored Gypsy Swing in the styles on Django Reinhardt and Stéphane Grappelli from the 30-50’s. The group is also merging the tradition with modern, more creative qualities of jazz expression with it’s own original compositions, bringing into being the possible future for this type of music in a fresh way. Some of the highlights in 2013 include performing the show-stopping slots in LinnaJazz Festival and Helsinki Festival. In 2014, the group delighted crowds in Kellokosken kesäsoitto- festival with a hilarious performance with Riku Niemi, among other occations. Django Collective Helsinki has worked among others with Antti Sarpila, Paulus Schäfer, Olli Soikkeli, Sami Saari, Raoul Björkenheim, Pentti Lahti and Riku Niemi. Laura began playing the violin when she was 5 years old. During 1996-2002 she studied at the Sibelius Academy performing arts department. She accomplished her A-examination / diploma with excellent grades in 2002. Laura has also studied at Stadia (currently Metropolia) in the Pop & Jazz department. She’s been a teacher at Pop&Jazz Conservatory, Western-Helsinki’s Music Academy and Metropolia. 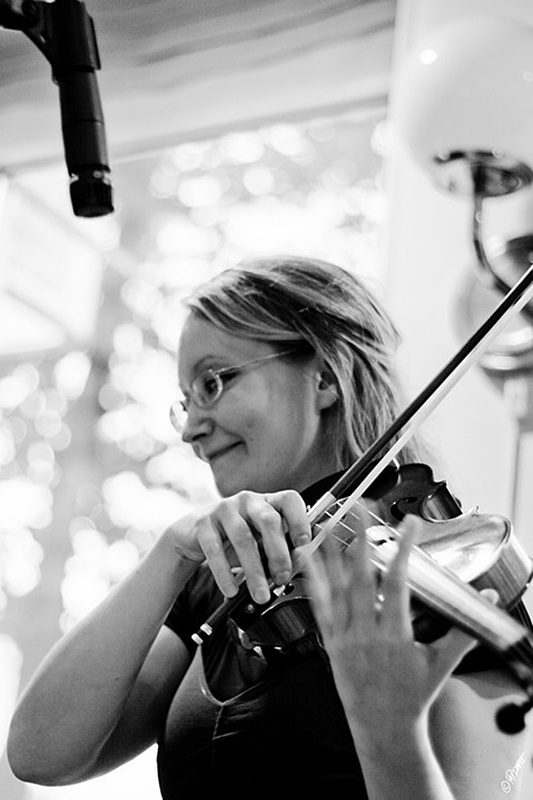 Besides the violin, Laura also plays nyckelharpa and mandolin. In various groups, she performs among others irish music, klezmer and Gypsy Jazz. Some groups to mention are: Freilach mit Kneidlach, Mustarastas, Cat Lee & The Company, Riku Niemi orchestra ja Jousikaiku-quartet. As a freelance musician she has performed on over a hundred records. Laura is also a composer, arranger and a lyricist. Check out Laura's own page. Aki began playing the guitar and the drums at age 14, self-taught at first. Since then, he’s worked as a musician, composer and an arranger in numerous groups and projects, many of them his own. Aki went through Tapiola Music High School and later studied at Stadia (currently Metropolia) in the Pop & Jazz department. He graduated as a Pop & Jazz pedagogue in 2004. Aki plays the guitar, mandolin, irish bouzouki, banjo, laud and the drums, both on records and live. In the later years, he has also been involved heavily in producing and mixing albums. Kimmo graduated from Helsinki University as a Master of Arts, major musical sciences in 1993. 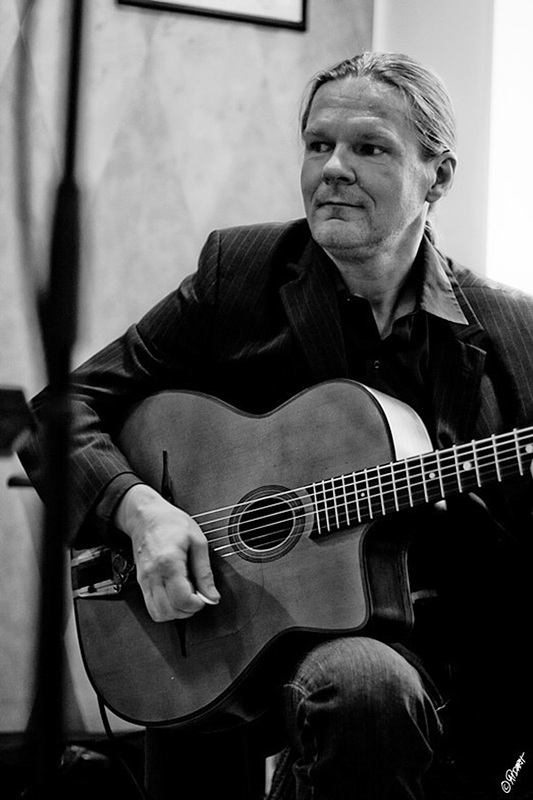 In 2003 he established Jazz Partout, a group playing Gypsy Jazz and Musette, with which he’s performed in numerous jazz festivals and released two albums. 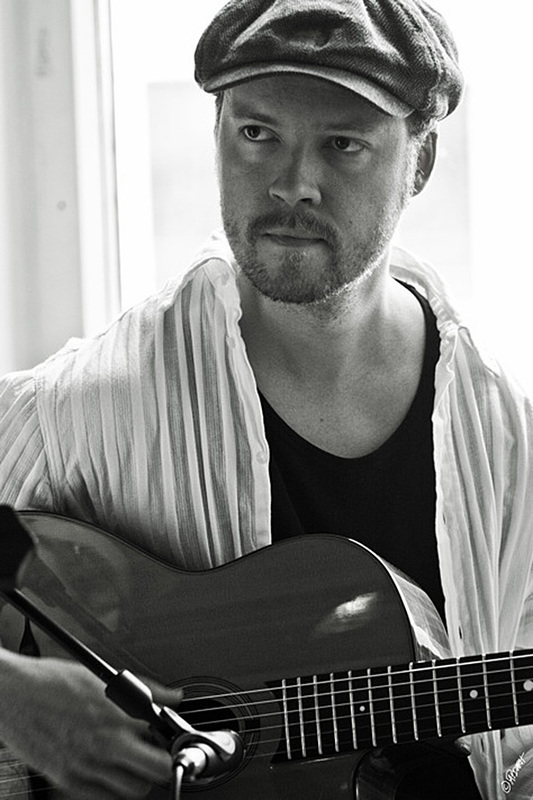 Kimmo is specialized in the french-style gypsy guitar playing in the spirit on Django Reinhardt. Tomi began playing drums at the age of 6, back in 1988. He studied drums a while at Joensuu conservatory, but eventually he chose the guitar. For the most part, he has learned the instrument playing jams. 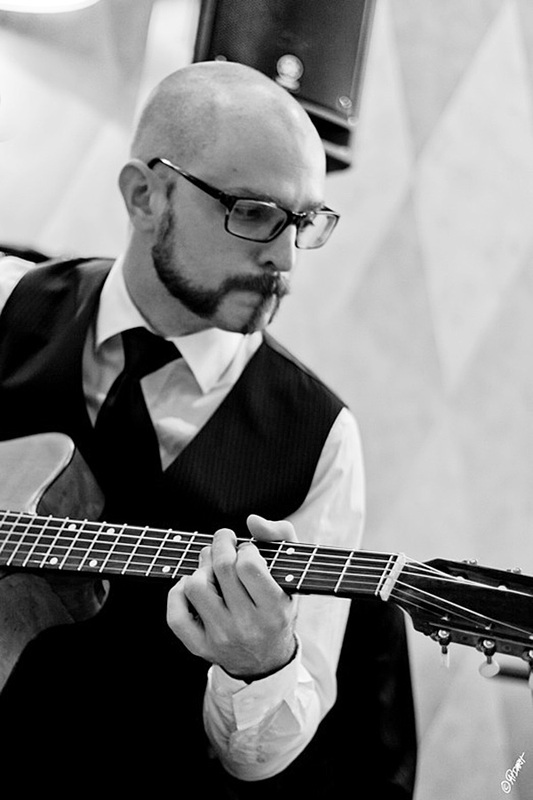 Since 2007 he’s been focusing on Gypsy Jazz. Nowadays, he’s one of the experts of the style in Finland. Tomi received a scholarship in 2008 from the Acre Kari foundation for deserving work in the field of jazz. He regularly performs at festivals and clubs, both in Finland and abroad. Other groups to mention: Gypsy Swing Unity and Wanha Swengi. 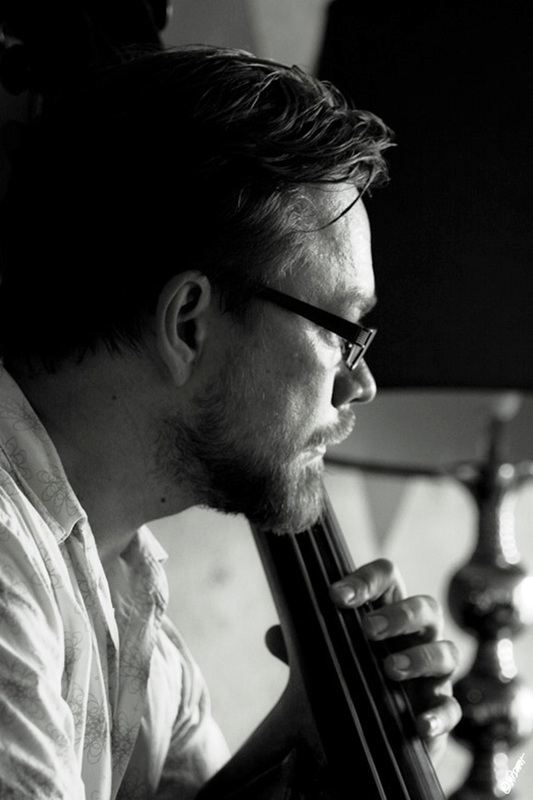 “Tero is a versatile expert in the various styles of jazz and ethnic music” (Rytmihäiriöitä, the rise of new jazz in Finland 2007, journalist Markus Partanen) Tero graduated as a Pop & Jazz Pedagogue from Metropolia in 2007. He currently teaches at Jyväskylä College. Other groups to mention: Korpi Ensemble, Juha Kujanpää Ensemble and King Loose.